With the threat of invasion and concerns over the strength of the French Navy during the Victorian Period, the then Prime Minister, Lord Palmerston, authorised the Royal Commission on the Defence of the United Kingdom in the 1860s. This culminated in a huge construction effort to defend the UK, with numerous Forts being built in key defensive areas around the British Isles. Portsmouth was the first town to become home to such Forts, their purpose was to aid the defence of the Royal Naval Dockyard from a land invasion from the rear. They became known as Palmerston’s Follies as the public perceived them as facing the wrong way! Fort Widley was constructed between 1861 and 1870 on top of Portsdown Hill to defend Portsmouth and the dockyard from bombardment from the rear. The total cost was over £90,000, with the fort being constructed from red brick, flint with tunnels mined into the chalk hills. Five forts were built along the hill, they are Fort Wallington, (completed in 1865), Fort Southwick, (1870), Fort Purbrook, (1870), Fort Nelson, (1871), & Fort Widley (1870). The Forts were all built on a similar layout, but with subtle differences designed in to confuse would be attackers and prevent the occupation off each fort in quick secession. The fort was disarmed in 1907 but remained in military hands being used as an army barracks for the Royal Artillery until 1939. During WW2 the fort saw a variety of uses; from 1940 it served as an ‘Action Post, Fire’ and in 1941 it housed a Royal Engineers Bomb Disposal Unit. From 1942 it was used briefly to house POWs and from 1943 it was used as an alternative control centre for Southwick House (HMS Dryad). After World War II , Portsmouth Council needed a new Civil Defence Group Control centre to be established; Fort Widley was selected for this role. 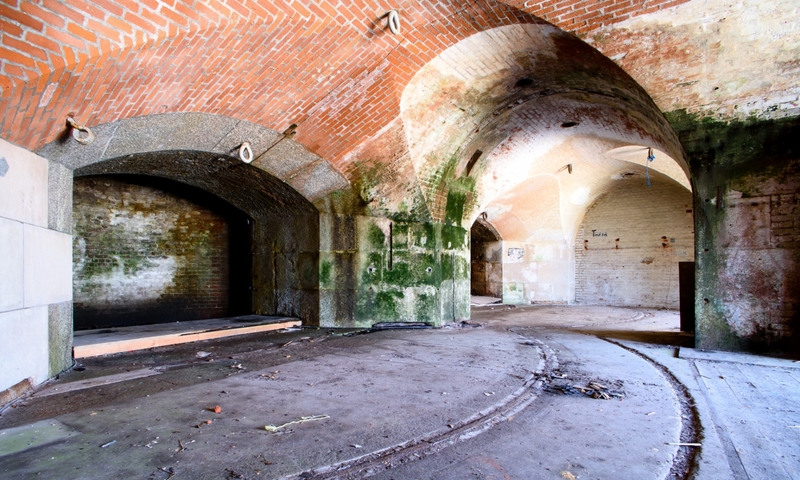 Work started in 1953 to convert the main underground magazine areas and the ground floor of the barracks. The centre was officially opened in January 1955 by Sir Sidney Kirkman, the then Director General of the Civil Defence. Portsmouth Council operated the centre throughout the cold war, buying the overall Fort in 1972. With the stand down of the Civil Defence Corps in 1968, the centre was temporarily closed. In 1974 Portsmouth Council reactivated the centre as the Portsmouth District Control and it also acted as the Standby County Control to the Hampshire County Main Control at Winchester. During the 1980’s it was redesignated as the Portsmouth District Council Emergency Centre, remaining operational until 1992 when it eventually closed. The Fort has since been put to new use as the Peter Ashley Activity Centre and houses an Equestrian Centre. Parts of the Fort have been restored.